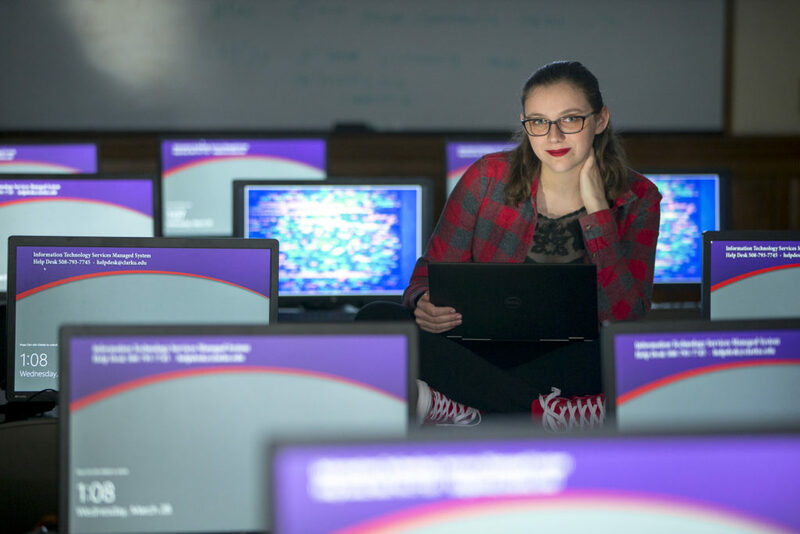 Editor’s note: Three years ago, Samantha Hughson ’19 launched Clark’s Women in STEM (Science, Technology, Engineering, and Math) to address the issues facing women in the technical professions. Since then, the group has picked up momentum, hosting alumni and faculty speakers, conducting student workshops, and pushing for more diversity training at Clark. Below, Hughson, who has accepted a position as a software engineer at TripAdvisor, shares some thoughts on her educational journey and the prospects for women in tech careers. I was the only woman in my high school AP Physics class, and I didn’t always ask questions because I didn’t want to seem less than my male peers. The guy sitting across from me asked if I was intimidated by all the boys, and my physics teacher laughed and said, “You should be intimidated by her.” I realized I felt the need to prove myself more — I still sometimes feel like that. My dad was a software engineer at Microsoft and I practically grew up on the Microsoft campus — we trick-or-treated there when I was a kid. He always wanted to make sure I had exposure to strong women in the field, so every year we had a holiday party at our house where I got to meet these great female role models. We started Clark’s Women in STEM in 2016 to share our experiences. Since then, we’ve had an alumni panel talk about their careers, professors have given talks about their research, and we’ve held student workshops with the LEEP Center on things like picking internships and doing research. We especially want to be a resource for first-year students. The fact is, computer science is male-dominated — it’s hard when you’ve got 10 female and 25 male students in a class. I know this is going to be my future. I remember texting with my dad after the first day of my internship at Amazon, and telling him how angry I was to be surrounded by all men. He told me that’s just how it is. I said, “I don’t care, I’m going to stay angry,” because that’s the only way we’re going to make a change. All the speakers we’ve had at Clark’s Women in STEM events told us: Don’t give up and don’t be silenced. The only way we can really create change is in partnership with the people running the industry — most of them men. We have to make some noise so they know there is actually an issue and it’s in their world. I attended the Grace Hopper Conference last year, and it was great to be among so many strong tech influencers who are women. When we talk about computer science, we need to talk about pioneers like Grace Hopper and Ada Lovelace — it can’t just be about Bill Gates and Steve Jobs, because that’s not inclusive of all the people who work in tech. Of course, the boards of tech companies are almost all men, so it’s not just about getting women into STEM professions. It’s about getting them a seat at the table. This story appears in the winter 2019 issue of Clark magazine.